“The Year Mrs. Cooper Got Out More” by Meredith Marple starts with a mysterious letter from 1999. From there readers are thrust forward into modern day 2014. Our main character, Mallory, age 55, is living in small town, Maine. The kids are gone and she’s at home and, “…as the laundry decreased, time on Facebook increased,” and so did her fear of leaving the house. Sometimes it seemed she was afraid of everything, not an easy character for me to like. But, the author has a way of pulling the reader in. There is a village of other characters intertwined in Mallory’s life in one way or the other. That’s when I began to enjoy this story, because as the secondary characters came to life in my mind, so did Mallory. As she developed, I could understand where her behaviors came from and I learned to hope she would be successful. In the meantime, I came to know the small town of Great Wharf, where our empty nester resided. Having lived in Massachusetts and traveled in Maine during the summers, I could easily picture this fictional town. Besides all the charm of New England, it includes secret lovers, young lovers and married lovers who have lost the gleam of each other’s eyes. There is even a cat with a story! Before too long though, bad things start to happen in this idyllic town on the coast and Mallory is surprisingly involved in one way another. About half way through, I started to read longer and longer each night. I wanted to know who the evil one was –after all this is a murder mystery. Let’s just say it all played out nicely. Interestingly, the letters from the past continue to interrupt the story sporadically, reminding readers that there is a back-story that is important. Sometimes they were cryptic, but it wasn’t too long before I knew what was going on. Or, at least I thought I did. 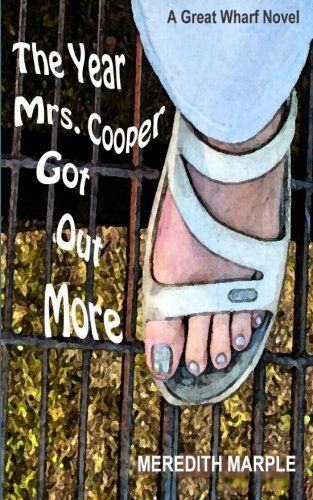 In “The Year Mrs. Cooper Got Out More,” Meredith Marple skillfully weaves the story line back and forth, and twisting it so that there are plenty of surprises. This reader left satisfied!